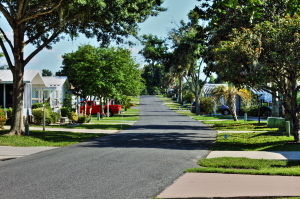 There are many mobile homes for sale in the Leesburg, Florida area. Why buy one at Lake Griffin Harbor? First, Lake Griffin Harbor is a Blair Group retirement community. Blair Group is one of the preeminent developers of retirement communities in Florida, a company that’s committed to giving adults 55 and older the opportunity to enjoy the carefree retirement lifestyle in a gated setting with comfortable housing and lots of onsite amenities. As with all Blair Group retirement properties, Lake Griffin Harbor has a full-time onsite management team that is there to ensure the smooth operation of the community and the satisfaction of all those who call it home. Second, our community is a place in which you can always expect to have some kind of activity to engage in. After all, Lake Griffin Harbor is a community that caters to active adults 55 and over – men and women wanting to pursue the active retirement lifestyle in a scenic setting. Just one look at our Activities & Events Calendar is all it takes to understand that Lake Griffin Harbor is by no means a “sleepy” retirement community. Our residents regularly meet up to play cards, go fishing, toss horseshoes, and go on excursions together outside of the community. There is always something interesting going on – on or off the water – at Lake Griffin Harbor in Leesburg. Contact Lake Griffin Harbor today for more information about what life is like at our pleasant lakeside retirement community in Leesburg, FL. We have an excellent selection of mobile homes for sale.